Cryptologic is a dinosaur when it comes to casino gaming software, as they've been in the business for over ten years. Ever since the beginning of online gambling Cryptologic has been developing casino software, including video poker software, and selling it to online casinos. Players love Cryptologic casinos because they're safe and have solid graphics and odds. Cryptologic is a player favorite when it comes to video poker because they offer decent pay tables and have a nice lineup of video poker variations. Since Cryptologic launched they have accepted over $60 billion in wagers, and have never had any scandals regarding payouts, fair odds, or corrupt employees. They're a safe, reputable, and overall outstanding company. 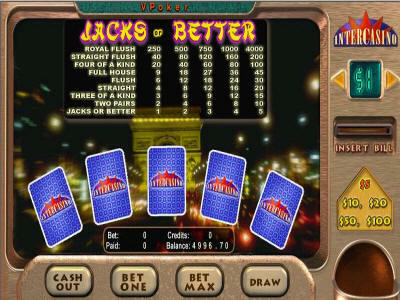 Cryptologic offers seven total video poker games including Deuces Wild, Double Bonus, and Jacks or Better. Unfortunately, Cryptologic offers mostly low pay versions of their video poker games, so if you're looking for the best possible odds you'll have to check out a different video poker casino. In the above Jacks or Better game you'll notice that a straight flush only pays out 40x and a four of a kind only pays out 20x. In a full pay game those hands would pay out 50x and 25x respectively. Because of those reduced payouts, the maximum payout percentage for Jacks or Better games at Cryptologic casinos is only 98.25% with perfect strategy as opposed to 99.54% at a full pay Jacks or Better game. Other Cryptologic video poker games like Tens or Better and Double Bonus also offer reduced pay tables, so if you're looking for full pay games you'll have to look elsewhere. **It is impossible to calculate the payout percentage for a progressive game without knowing the current progressive jackpot.